Enjoy songbirds’ sweet melodies and beautiful colors with the Stokes Select® Songbird Vintage Feeder. 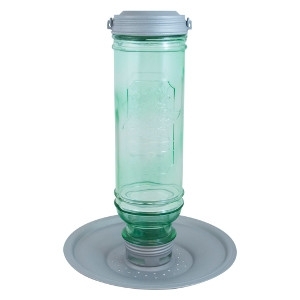 Its Stay Full Port® design keeps seeds flowing to hungry birds. The Choose Your Birds® removable thistle ring instantly converts the 4 seed spout ports from mixed seed to thistle, allowing you to serve any seed. The top lid unscrews for convenient filling and easy cleaning, and built-in drainage holes on the metal seed tray prevent rain accumulation. With an Americana-inspired glass bottle and pewter metal accents, this feeder has a vintage feel that beautifully blends with its contemporary features.